Lid of the Sarcophagus of Palenque, Lid of Palenque, Palenque, Maya Art, Maya, precolumbian reproductions, mesoamerican reproductions, mayan art, arte maya. Temple of Inscriptions, Palenque, Mexico. 692 A.D. In the city of Palenque, in a temple on top of a pyramid, the archaeologist Albert Lluillier found in 1952 the access to a funerary cript that houses the sarcophagus of the King Pacal Votan the Great (615-683 A.D.). The Soviet scientist Alexander Kazantev came out with the theory that the relief on the lid of the sarcophagus represents an astronaut and his spaceship but according to the Mayan legend, the symbology of the lid shows King Pacal falling into the jaws of the Earth monster each night to rise again with the power of the sun each morning. Its teeth are enlarged to demonstrate its encompassing power. At the top is the mythological "Moun" bird. 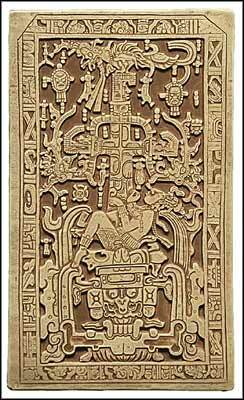 The pillar-like construction above Pacal"s head is the tree of life. The lid is twelve feet long.